For the other versions of this character, see Crow Hogan (disambiguation). Crow, alongside "Blackwing Armor Master". Crow Hogan is one of the primary protagonists in Yu-Gi-Oh! 5D's as well Yusei Fudo's and Jack Atlas' childhood friends from Satellite, and later the second Signer with the Tail Mark of the Dragon. He is also the foster brother of Yusei and Jack. Crow is the last of the main protagonists in Yu-Gi-Oh! 5D's to appear in the show. His role is somewhat limited at first, as he does not show up until the Dark Signer arc and often moved in and out of the story. 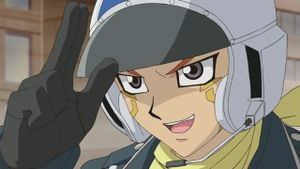 He plays a much more prominent role in staring in the Pre-World Racing Grand Prix arc, acting as one of the three primary characters alongside Yusei and Jack. An alternate universe version of Crow appears in Yu-Gi-Oh! 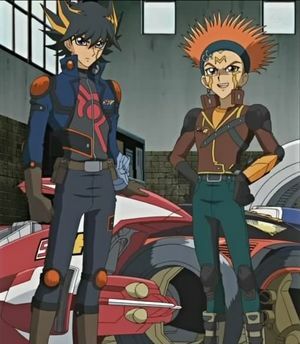 ARC-V.
Crow has dark-grey eyes and brushy-spiked orange hair with a viridian headband embroidered with two rings at the right side. He wears his outfit from his days as a part of The Enforcers, which consists of blue jeans, a yellow t-shirt, and a sleeveless brown cargo vest. He also wears a pair of earrings in the shape of washers. While riding his Duel Runner, he always wears a beak-shaped black helmet with plumes sticking from the sides, which includes an orange eyeshield and decorated with a red gem. During the World Racing Grand Prix he work a brown racing leather jacket. One unique thing about him are the criminal marks on his face. He has been marked at least twice; he only had the "M" in his time with The Enforcers so he gained the dot and eye marks after leaving the team. Though possessing similar qualities and ideas to Yusei, such as having a selfless and heroic personality, helping others when needed, Crow is proven an impulsive and daring person who will rise up to any challenge and show that he is not a pushover. He is also generous and altruistic, as he is willing to fight for the sake of his friends and for those he considers his family, including underprivileged children that he helped raise in Satellite. In the dub Crow has a fear of clowns due to an incident on his fifth birthday. Crow seems to have taken Jack's advice to heart about growth. At the final party between Team 5D's, Jack stated if the bonds of his friends are inhibiting his growth, that means it is time to move on his own. Eight years later, after realizing his Turbo Dueling team has nothing more to offer him nor does he have anymore more to offer them, he decided it is time to duel full-time on his own. According to Katsumi Ono, the name Crow Hogan (クロウ・ホーガン Kurō Hōgan) is based on the title Kurō Hōgan (九郎 判官 Kurō Hōgan) held by General Yoshitsune. Crow's becoming friends with Yusei and Jack. Crow was orphaned after his parents died during the Zero Reverse incident. He had no other family or friends to take him in, so he was on his own. He didn't know when he would be able to find food, clothes, or a decent place to sleep, so he dreamed of soft beds and warm meals, felt that he could only rely on himself, and was lonely with only his shadow for company. He spent a lot of his time wandering around Satellite alone. Not having been to school, he could barely read, spell, write, and perform arithmetic. He never really enjoyed being on his own and not having rules to follow as it was dangerous for a child to be on their own in Satellite. Crow hoped most of all that he would one day become a professional Duelist and escape Satellite. One day, while wandering around a dump, he discovered some Duel Monsters cards, including "D.D. Crow" and "Crow Goblin". He decided to use them to start a Deck with. While admiring the cards later, he met a group of people, who befriended him and taught him how to play Duel Monsters. Through Duel Monsters, Crow improved his reading, spelling, and arithmetic skills. 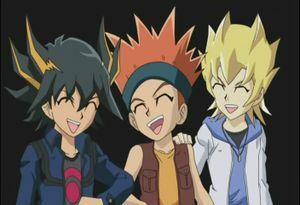 While playing Duel Monsters with other children, he came to meet Jack Atlas and Yusei Fudo. The three of them were able to accept each other for who they were, and so became best friends, cared about each other, Dueled one another often for fun, and grew to be as close as brothers. Crow came to view them as his family. Martha became his caretaker and Crow accepted her as a foster-mother. 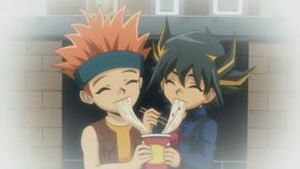 Yusei and Crow eating a cup ramen together. While living in Martha's care, Crow enjoyed eating cup ramen and even ate from the same cup as Yusei at the same time. Crow set up a hideout near the Daedalus Bridge. Remembering how tough his own childhood was and that Duel Monsters had saved him, he began to take care of children who needed someone to look after them in the area. He fed them and let them live with him. Crow also supplied them with Duel Monsters cards he would steal for them and taught them all how to Duel. His crimes led to him getting three criminal marks for his actions. Crow with the rest of the Enforcers. As a teenager, Crow and his friends Jack and Yusei met Kalin Kessler. The three of them were able to accept Kalin and became best friends with him. They cared about him and grew close to him as a brother and a comrade. The four of them formed a Duel Gang, The Enforcers, with Kalin as their leader in order to make the most of living in poor conditions in Satellite. With the team, Crow earned the nickname of "Crow the Bullet." The Enforcers began to Duel other Duel Gangs and take over the various sectors of Satellite. The four of them Dueled while connecting Deathmatch Duel Ropes to their opponent's Duel Disks, which would destroy them upon the opponent losing. In Sector D, Crow deliberately allowed the Magician's Four to defeat him. This triggered a transmitter inside his Duel Disk which allowed the rest of his friends to come to his aid and discover the lair. Together the four of them defeated the Magician's Four and took over their zone for themselves. When Crow, Jack, Kalin, and Yusei were facing another Duel Gang with the four of them being up against twenty members, Dueling several of them at once, one of the members attempted to kill Yusei by throwing him off of the roof. Kalin caught Yusei by the connected Duel Rope and pulled him up, saving his life. With that gang defeated, the Enforcers had captured all of the zones in Satellite. However, Kalin's personality began to change for the worse. He became cruel, domineering, and unpredictable, letting the power get to his head. After he assaulted a little kid from a Dueling Gang after he had defeated him in a Duel, Crow attempted to stop him but Kalin punched him. Jack and Yusei broke up the fight. Afterwards Crow and Jack left the team. Crow and Jack rejoined the team to help Kalin after he was pursued by Sector Security. However Kalin was arrested and the team disbanded. Crow, Jack, and Yusei all went their separate ways. Sometime later, an incident occurred one night while he was at his hideout. As Crow tried to deal with two intruders, Robert Pearson appeared along with Bolton. Pearson and Bolton Dueled against the two individuals. Crow finds out that Pearson also looks out for children in Satellite. However, Pearson is different from Crow due to the fact that he made sure that the kids can fulfill their own potential. Their shared objective is why Crow helped Pearson with his research, which was an engine made from junk from the Satellite. Later on, Crow arrived at the scene of a fire, where he found Pearson. Knowing that he can't be saved, Pearson asked Crow to take his Duel Runner, and then gave him his Duel Disk. The Duel Runner, the Blackbird, has a set of retractable wings, inspired by the Daedalus Bridge legend. Unbeknownst to Crow, hidden inside the Blackbird was the card "Black-Winged Dragon". After stealing several Decks from a Security warehouse, Crow gets chased while riding his Duel Runner. In order to hunt him down, Security activates the Turbo Duel system and engages Crow in a Turbo Duel. Crow easily defeats his opponent in a One Turn Kill. He comes to an isolated area with many children, showing and giving them the cards he stole. Crow then goes into his place and sees Yusei winning the title match of the Fortune Cup on the news. Crow reunites with Yusei after Yusei returns to Satellite. Yusei takes him back to his base, to visit his friends. However, the Security, who were after Crow earlier track him down. 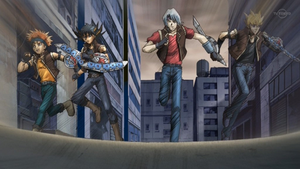 Crow arranges a rendezvous at Daedalus Bridge, while he and Yusei team up in a Tag Turbo Duel to defeat the Securities. Crow and Yusei meet up with Blister, Nervin, Blitz, Tank and Rally at the rendezvous point. Crow introduces his friends to the children and tells the legend of the Daedalus Bridge. Later that night, Yusei tries to leave in order to investigate the place where he thinks the Dark Signers are located. Crow refuses to let Yusei go without him. Riding their Duel Runners, they see a huge geoglyph and head towards it. Crow nearly gets hit by the card "Vorse Raider" thrown by Kalin. Kalin, now a Dark Signer, sets up a huge shadow field in the shape of his birthmark, separating him from Yusei in order to engage in a Shadow Turbo Duel against Yusei. The Shadow Turbo Duel came to an abrupt end just before Yusei would have lost when his Duel Runner crashes. After a large shard from the Duel Runner impales Yusei (which was cut from the dub), Crow takes him to Martha so he can be operated on by Dr. Schmidt. After Yusei recovers from surgery, Crow is glad that his friend recovered. When Lazar goes to Satellite on Goodwin's behalf, Crow sees him, and mistakes him for a Dark Signer. He tries to capture Lazar,but what he caught was a substitute. Crow corners him in the same place where the Enforcers defeated the Magician's Four, and forces him to Duel using the same house rules that the Duel Gangs did back then. However, the appearance of the black fog causes the Duel to end prematurely. Crow rushes to escape on his Duel Runner. Crow takes refuge in a refrigerator, to avoid being captured by the fog. After the fog clears, Crow searches Satellite, finding everyone has disappeared. Shortly afterwards, he finds Greiger, who is also now a Dark Signer. To avenge the children Crow imposes a Shadow Turbo Duel. Greiger initially refuses to Duel a non-Signer, but Crow manages to let on he has a bomb (in the dub an EMP generator) in order to convince Greiger to face him. Remembering Yusei's encounter with an Earthbound Immortal, Crow insists that both players turn off autopilot, as he thinks he'll need his own maneuverability to dodge attacks from an Immortal. Yusei interrupts the Duel, insisting that both players should stop. Crow refuses and tells Yusei of his reasons for challenging Greiger. Greiger later Summons "Earthbound Immortal Chacu Challhua". Just when all seems lost, Crows draws his final card. He then goes on to Synchro Summon "Blackwing - Silverwind the Ascendant". Using this card, he wins the Duel, making him the first non-Signer to win on his own against a Dark Signer. Once Greiger's Earthbound Immortal is defeated, Crow indirectly freed the people from Greiger's village who included Annie and Max. However Greiger consequently turns into dust following his defeat. Crow later watches Yusei's Duel against Kalin as a spectator alongside Luna, Leo, and Trudge. After the Duel finally ends with Yusei victorious, Crow and the others travel to where the original Ener-D Reactor is because Roman Goodwin has challenged Yusei to a Duel. Once there, while Yusei, Luna, Leo and Trudge enter through the stairs from the crater, Crow spots another opening because he notices some Security helicopters nearby. He goes to check it out while Yusei and Roman's Duel is taking place. He finds a picture of Yusei and his parents and doesn't know who they are. He also finds Goodwin, but all Goodwin tells him is if Yusei beats his brother, he will be waiting for him. Goodwin escapes, so Crow finds his way to the original Ener-D Reactor, much lower then the others, as Yusei confesses that he feels responsible for everyone's lives being ruined because of his father's experiments. Crow yells back, saying that he didn't know Yusei was harboring these feelings, and that he was sorry he didn't notice. But, Crow feels really happy that he made friends with him and Jack and many others. He yells out as Yusei falls into the Ener-D Reactor, but is unable to do anything. He manages to reach the level that Luna, Leo and Trudge are on, and while Leo believes Yusei is dead, Crow firmly believes Yusei is alright, because Yusei could never die here. He is surprised, but glad, when Yusei returns, though unconscious. He and Trudge catch Yusei, and set him down on the ground. Crow tells Yusei to wake up and he does wake up, though a little weak. Crow's arm with the Tail Mark of the Dragon. 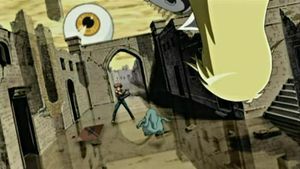 Crow, Yusei and Jack engage in a Turbo Duel against Goodwin, as he plans to sacrifice a Signer in order to welcome the arrival of the King of the Netherworld to New Domino City. Through the Duel, Rex revealed that he was the legendary man from the Daedalus Bridge story. However, Crow still fight for the legend regardless of Rex's remarks. When Rex uses the effect of "Earthbound Immortal Wiraqocha Rasca" to lower Crow's Life Points to 1, he is blown out of the geoglyph from a combination of the effect and one of the creatures from the King of the Netherworld. He uses the flight mode on his Duel Runner to fly back up and take out Rex's "Moon Dragon Quilla", as well as activating his "Blackwing Anchor" Trap Card. Crow then lands on the geoglyph but as one of his Duel Runner's wings break, he then falls down and is unable to continue with the Duel. Even though eliminated because of this, his "Blackwing Anchor" remained active and was used by Yusei later on. Before Goodwin is about to be defeated, all of the Marks of the Dragon return to their owners. However the Dragon Head mark appears on Yusei, replacing his former Tail mark. The Dragon's tail birthmark appears on Crow, causing him to inherit the role of the fifth Signer. Crow in his job outfit. 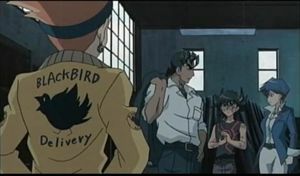 Crow becomes a delivery man, calling his service Blackbird Delivery and using his Duel Runner as the vehicle. He, Yusei, and Jack share an apartment owned by Zora and spend almost all of their time designing a new Duel Runner engine, with Yusei focusing on schematics and Crow and Jack focusing on testing it out, although this normally results in them blowing the workshop up or just generally making a mess. Later, after Trudge is attacked by Ghost, he, Jack, and Yusei search for Ghost on the highway. After Yusei finds Ghost, the other two are left to watch their Duel. After Yusei defeats Ghost, they find out he is a robot and Yusei believes that a new threat is coming. Crow is given the job of convincing a withdrawn man, Mr. Bashford, to move into Martha's, due to the dangerous nature of his own house. Crow is subjected to a series of traps, as he tries to enter Bashford's house, causing him to stumble upon an old fashioned Duel Arena. Using it, Crow Duels Bashford in order to convince him to come to Martha's. After Crow wins, the mountains of junk at Bashford's begin to collapse, but Crow saves Bashford by pulling him into a refrigerator. Crow, Yusei, Jack and Blister learn that Bashford misses his son. They tell him that they can be his sons and convince him to come stay at Martha's where he'll have plenty of grandchildren. On the day of Akiza's final exam, Crow and Jack help Yusei modify and improve her Duel Runner so that she can Turbo Duel and obtain her license. Like the rest, he is present during her first official Turbo Duel, in which she is able to defeat Trudge. He then helps Yusei build a Duel Board for Leo. Later on, along with Akiza, Jack, and Yusei, Crow witnesses Leo and Luna Duel Lester in a Turbo Duel. After Leo and Luna's loss to Lester, Crow and Jack discuss the changes that have recently taken place in their lives. The two grow concerned for Yusei, as Crow points out that he does tend to keep some of his feelings to himself rather than share them with his friends. The two decide to go find him and figure out what's troubling him once and for all. When they meet up with Yusei, he reveals his unease around Ghost, and tells them that he suspects that Iliaster is behind everything, as Roman had told him that it was a man from Iliaster who set him down the path of becoming a Dark Signers. Furthermore, they are using the WRGP for some mysterious plan, if Sherry was to be believed. The three decide to work towards mastering Vizor's Accel Synchro Summon as a means to effectively combat the new Iliaster plot and to protect the city. When Yusei takes in an amnesiac named Bruno, he willingly accepts him into their home. Zora is suddenly feeling down and when Yusei asks why, she reveals that the Poppo Time Grandfather Clock that hangs above their apartment door is broken and needs to be taken down. Zora's son, Lyndon, comes from overseas to repair the clock, but he is turned down by his mother. Due to a turn of events, Crow Duels Lyndon and he and his mother reconcile. Crow saved Kalin from Lawton, throwing "Blackwing - Gale the Whirlwind" at Lawton's shotgun. The next day, he, Yusei, and Jack said good-bye to, who decided to stay to rebuild Crash Town and take care of Nico and West. Crow's and Yusei's new Turbo Duel suits. Crow is asked by Trudge to take part in an investigation about the mysterious Duelist who faced Robert Pearson before his death. However, he notices a small error in his Duel Runner. His only lead is a Synchro Monster, "Crimson Mefist". used by the Duelist. His investigations lead him to another person connected to Robert, Bolton. 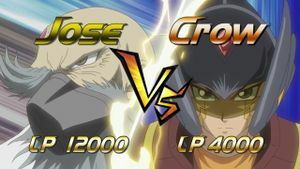 In order to find out the truth, Crow Duels against Bolton, wagering the legendary "Black-Winged Dragon", even though Pearson at the time of his death didn't leave the card to him. During the intense Duel, Crow discovers that Bolton is responsible for Pearson's death. Crow's determination to fulfill Pearson's will makes his Mark of the Dragon react and reveal a hidden compartment in his Duel Runner, containing the card "Black-Winged Dragon". Crow Summons it, causing Yusei and Jack's Marks of the Dragon react to it, as they conclude that its also Crow's Signer Dragon. As for Crow, with the help of this Dragon he is able to defeat Bolton. While training for the WRGP, Team Catastrophe played the dark card given to them by Primo while riding on the highway in order to sabotage Crow, resulting in a shoulder injury serious enough that he must sit out some of the tournament. Akiza then volunteers to temporarily replace him. Crow is upset at first, but eventually warms up to her to the point of calling her out so that she can practice. However, he supported his team during their first Duel with Team Unicorn. After Akiza lost, he tried to encourage her. He was astonished when Yusei Summoned "Dragon Knight Draco-Equiste", wondering what that monster was. Crow later congratulated Yusei after he defeated Team Unicorn by himself. During the celebration, he and Jack started to argue because Crow said that without him, Team 5D's would be in a bad situation, and Jack wasn't good enough. During their second round match with Team Catastrophe, he figured out that Akiza was wounded by the very same card that wounded him earlier, which upsets him even more. Crow decides to push his limits to bear the pain in his shoulder. When he came to challenge Team Catastrophe, he learned something strange about his opponent. He managed to dodge the shadow attack that injured Team Unicorn as well as Akiza. Ultimately even injured, Crow defeats "Hook the Hidden Knight" with "Black Winged Dragon". The gang soon learn of the swarm of Duelbots known as Diablo attacking Duelists all over New Domino. Crow wants to help, but is advised not to since his arm was injured in his Duel against Team Catastrophe. Later, he complains he cannot wait any longer, and joins Yusei, meeting the Three Pure Nobles. After he went with Jack, Yusei and Bruno in search for brand new cup ramen, they met Lazar. They tried to catch him, but he escaped. Later, Jack decided to lure Lazar in a trap using a cup of ramen as a bait. After Crow lost to Jack in rock-paper-scissors game, he had to dress as Cup Ramen Man during promotion of Red Demon's Noodles. After Crow defeated three men, Lazar appeared. Jack's trap was successful and a gang surrounded him. Lazar escaped again, but Yusei put a tracking device on him which helped him locate Lazar. Crow then Dueled Lazar for information about Iliaster. Lazar tried to stop Crow from Synchro Summoning, but Crow dodged it using "Blackwing - Aurora the Northern Lights". During the Duel, Lazar's son and wife appeared, cheering for him. Seeing that Lazar is fighting for his family, Crow tried to lose on purpose. After Lazar understood that Crow was trying to lose, he decided to lose before him. He purposely destroyed "Blackwing - Anchor", and he lost due to its effect. Crow was also present during the examination of Lazar. He went with others to the database of Sector Security which is a Turbo Duel game. After Lazar lost, he wanted to Duel, but he gave the chance to Akiza, who won. After Jack lost, Crow criticized him and both of them started to argue. Later, when Yusei Dueled Cup Ramen Man, Jack was wondering why Yusei lowered damage, but Crow responded that Yusei's strategy is to power up "Jester Queen". Later, while Yusei, Bruno and Sherry are undercover in the Momentum Express Development Organization building, one of Crow's piercings comes out in a series of accidents, a Japanese superstition signifying dreadful events in the future (Yusei and co. being found out and sent through a worm hole). After Jack lost to Jinbei Tanigawa, Crow as second wheeler Dueled him. In order to destroy "Hand-Holding Genie", Crow first Summoned "Blackwing Armor Master" and put a Wedge Counter on it. Then he attacked it with "Black-Winged Dragon", winning the Duel. After Crow stopped the third member of Team Taiyo, Taro Yamashita, from damaging his Life Points, he noticed Taro was smiling. Crow then understood that something was wrong. After he understood that Team Taiyo strategy is to Summon "Zushin the Sleeping Giant", Crow tried to destroy "Key Mace", which will be Tribute for Summoning "Zushin", but he failed. He lost the Duel after Taro attacked him using "Zushin", but not before he activated Jack's "Monster Baton", discarding "Blackwing - Boreas the Sharp", leaving it for Yusei. After the victory of Team 5D's over Team Taiyo, Crow, Jack, and Yusei learned the story of the "Aesir" cards from Team Ragnarok. When Team 5D's faced Team Ragnarok, Crow Dueled Broder. The Duel revealed the similarities between the two. Although Crow Summoned "Black-Winged Dragon", his Life Points were reduced to 50 rather quickly, due to Broder Summoning "Loki, Lord of the Aesir" and still having his teammate Dragan's "Thor, Lord of the Aesir" as well. Although it looked as if Crow was about to lose, he managed to activate the effect of "Black Wing" to bring Broder's Life Points down to 0. However Broder, refusing to lose, activated his own Trap Card and reduced Crow's Life Points to 0 as well, ending the Duel in a DRAW. In the final match against Team New World, Crow Duels against Jakob, who had defeated Jack and stole "Red Nova Dragon" thanks to "Meklord Emperor Granel" and its effects. He tries to destroy and then remove from play "Granel" with the help of "Aurora" with the effects of "Blackwing Armor Master" and his "Steam Token". Though he tries hard to overcome the "Meklord", Crow only lasts a few turns and, in the end, sacrifices himself in order to leave Yusei his "Black-Winged Dragon" and "Shadow Impulse" so that he stands a chance against Jakob. During the continuation of the Duel, Crow calls out to Yusei while he is half conscious in the infirmary with Jack. He is transported, along with the rest of Team 5D's, to the Three Pure Nobles' visions of the future. He watches as the power of Synchro Summoning and Ener-D become too powerful over many years, creating a second Zero Reverse via the Meklord Emperor Genocide. After returning to the present, he is conflicted as to whether what he just saw was the truth or not, but continues to believe in Yusei and the future he and his friends are creating. 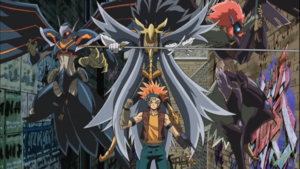 Along with the rest of the Signers, Crow later accompanies Yusei in an assault of the Divine Temple. Before they do so, he receives the "Z-ONE" card from Elsworth, who asks that he return the card to Sherry if they should meet in the Temple. When the team splits into three groups due to Z-one's trap, he travels with Akiza to the center of the structure. Sherry guards the gear, prompting Crow to return "Z-ONE" to her. They proceed to Duel Sherry in a Battle Royal. Sherry plays her "Ecole de Zone" Field Spell Card, separating them. Crow and Akiza struggle for a few turns, but then Akiza sees through Sherry's trick and successfully summons her "Black Rose Dragon" and uses its effect to destroy the Field Spell. The two are reunited, but Sherry fights back by using "Z-ONE" to activate "Soul Binding Gate". Because of the effect of the new Field Spell all three of them receive damage, with Akiza on the verge of being defeated, but Crow saved by them. Akiza returns the favor by saving him from a direct attack from Sherry's "Sorciere de Fleur" and helping win the Duel. During the Duel, Sherry reveals to them that she wishes to create a world where everyone gets to be with their family, herself included. Crow was hesitant to continue fighting when he saw a few orphans from the Satellite in the vision, but Akiza quickly reminds him that millions of people will die if they let Sherry and Z-one destroy New Domino City. She also tells him that as long as he believes in the future, anything can be done. With his conviction returned, they continue the Duel. Sherry is defeated, and her "Soul Binding Gate" crumbles, threatening to crush her. Both Akiza and Crow try to save her too and almost suffer the same fate. Fortunately, Akiza's "Black Rose Dragon" whose still materialized, saves them. Crow and Akiza wonder if it was because of a thin layer of psychic power. They convince Sherry to join with them and change the future. Eventually, Crow, Akiza, and Sherry all reunited with Yusei informing them all of his Duel with Bruno. After grieving, they all confronted Z-one. However, before Yusei could challenge him, Aporia arrives and shocks everyone, including Crow, and Duels Z-one in Yusei's place to not only reveal the kind of Deck Z-one has, but to show Team 5D's the hope he received from them. In the end, after Aporia lost, Crow gave Yusei "Black-Winged Dragon" to use in his Duel with Z-one. 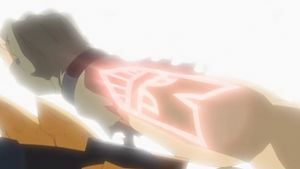 During the Duel, Z-one's mask is damaged and is shocked to see Z-one have the same criminal mark as Yusei. Crow as a member of Sector Security. At some point after Yusei's battle with Z-one, he becomes a member of Sector Security. After witnessing Jack and Yusei's Duel, he decides to leave New Domino City to continue Dueling as a professional Duelist. He joined the Shingon League, where he formed a team with two other Duelists. Eight years later, he left his team in order to join the Ride Ace League, where he would be able to challenge Jack, who was now the "World King". His team members were distraught, but Crow recommended Leo as his replacement. Crow with his Blackwing Synchro Monsters. Crow uses a "Blackwing" Deck, primarily focused on swarm and beatdown tactics. He mainly uses cards such as "Blackwing - Gale the Whirlwind", "Blackwing - Blizzard the Far North" and "Rendering Tuning" to easily Synchro Summon his ace monsters, "Blackwing Armor Master" and later his "Black-Winged Dragon". He also uses cards like "Down Force" and "Trap Stun" to prevent his opponent's Trap Cards from disrupting his strategies. Crow also uses a "Blackwing" Turbo Deck. To counter Team New World's "Meklord Emperors", Crow utilizes "Blackwing - Aurora the Northern Lights", allowing him to indirectly use the abilities of his Synchro Monsters. ↑ This card is Set in episode 85, but not activated. ↑ 2.0 2.1 This card can be seen in his hand in episode 30. ↑ This Set card is destroyed by Greiger's "Flying Fortress SKY FIRE" in episode 52. ↑ This Set card is destroyed by Bolton's "White Warrior - Fog the Treasure Shield" in episode 95. This page was last edited on 11 January 2019, at 14:35.